To spend the summer by the sea/in the woods/free as a bird, you need a house that is mobile. Living out of a backpack makes you feel both cool and confused, embodied well in this photo. I bought this bike for $50 and strapped my backpack to the provided rack with a bungee cord. Unsurprisingly, I got about 3 flat tires a day. Fixed for 10 cents in whichever village I was in. For this trip, I wanted a car I could sleep in. Mostly so in unpredictable northern BC I could pull into any random roadside and crash for the night with no fear of strangers opening up the fly of my tent (I may have been reading a lot of crime books recently…). SO! Time to buy a car. My enterprising dad found one used for cheap (he has a knack for these things). Bought it at 8pm on a Friday and left for a festival 5 hours away that very night! 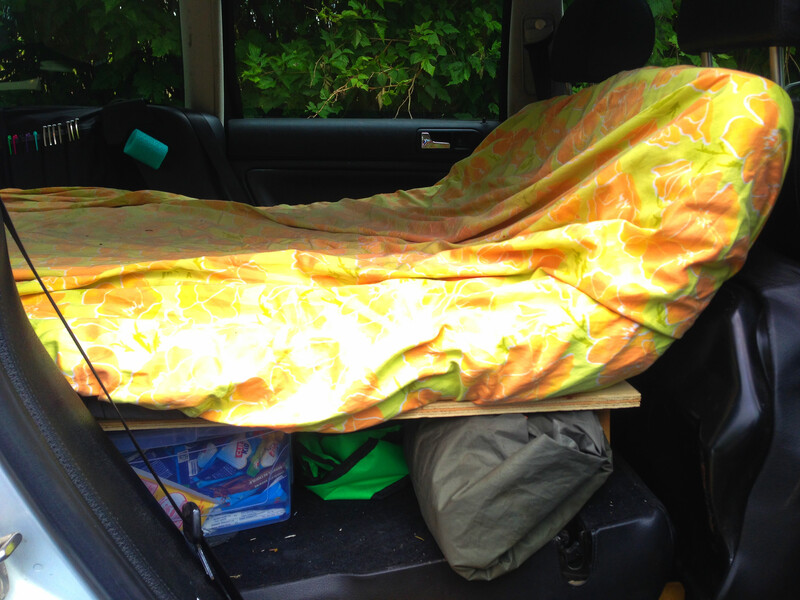 Arrived at 1am, rolled my mat into the backseat and I was all set. The backseat is exactly the length of my body from head to toe! 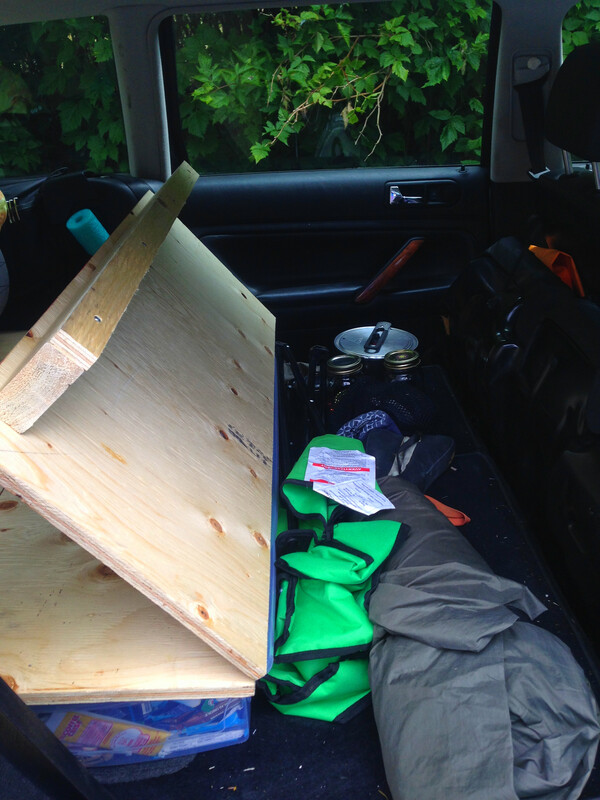 The bed frame allows me to easily slide 2 big totes, one clothes and one cooking stuff and tools. 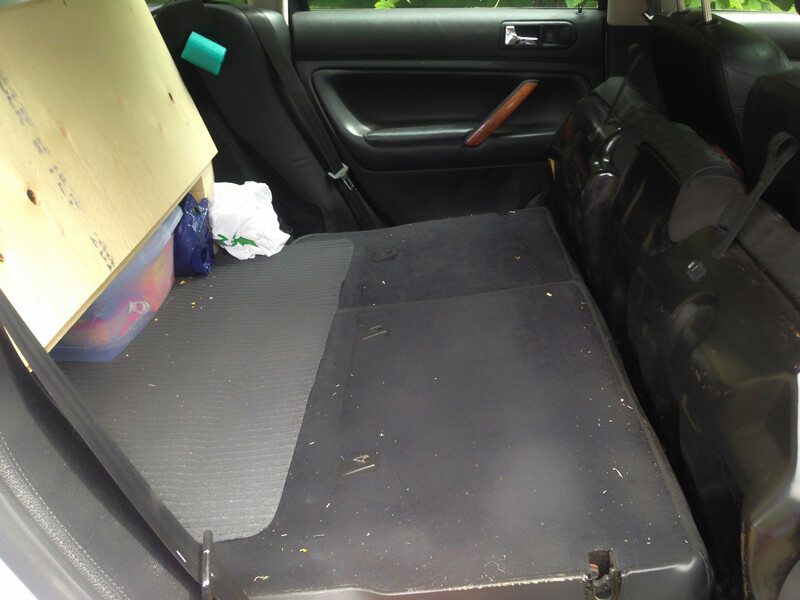 A third giant tote filled with food lives near the front, along with tent, folding chair, and cookstove. 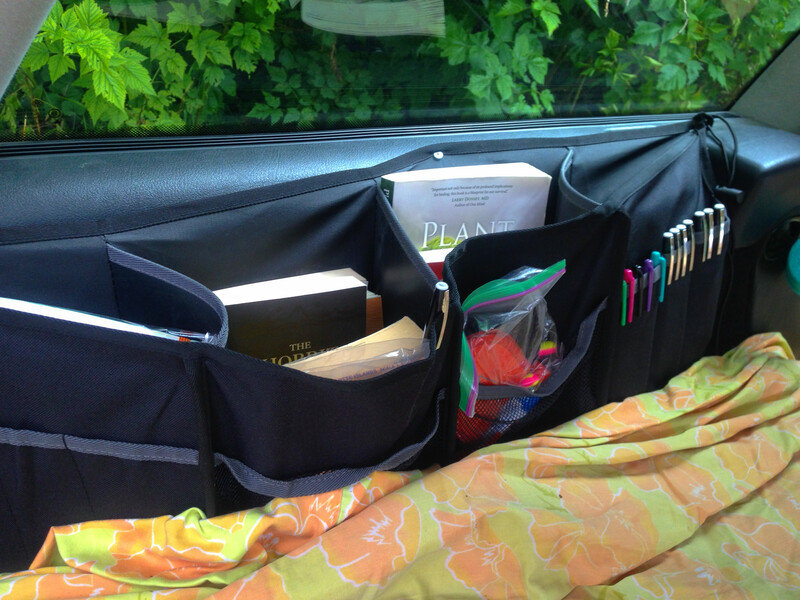 $10 Canadian Tire backseat organizers screwed into the car frame organize the ridiculous amount of books I brought. The mattress rolls up and the bed folds back to allow the seats to be used. 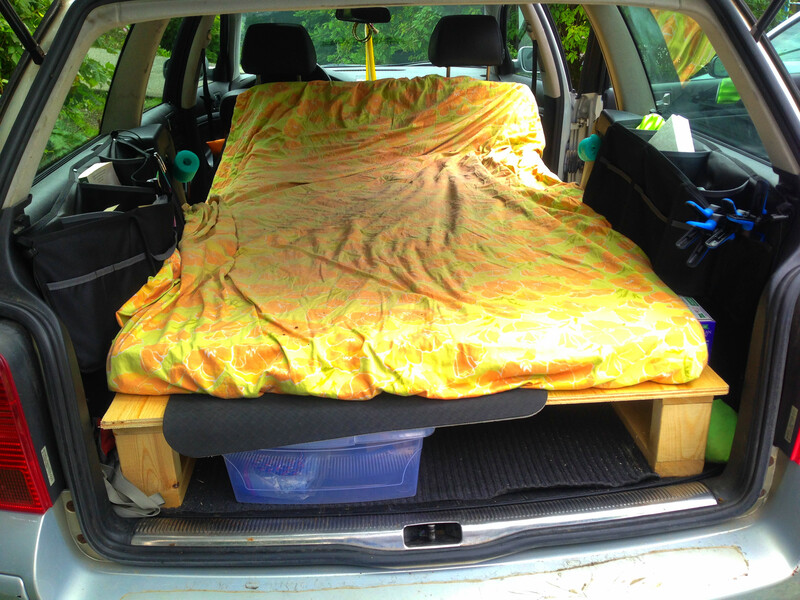 The seats folded flat to begin with, the mattress was mostly for storage. 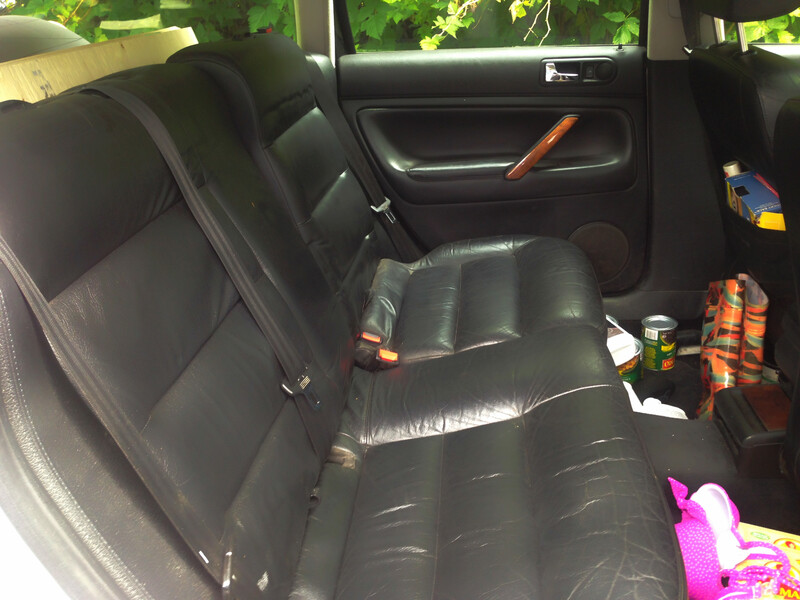 Full storage and I can still have the back seats! My brother, sister-in-law and dad (not pictured) figure out how to put on my bikerack. If I feel more sketched out (at any random roadside stop, for example), I can go ultra-stealth mode with full window coverage. This has the added bonus of full light blocking, for sleeping in brightly lit rest areas, and of insulating so I am always perfect temperature. I bought reflective insulation stuff for $1/foot from Rona and cut it to fit. Plus it looks like a space car. I easily fit everything I need in there, and the sleep is great! I’ve driven about 3000 km so far and it’s been a dream. Freedom on wheels! Next Post Making Friends, or, how I met a Soviet Indigenous healer picking berries on the roadside.